‘The Red Rose of Lochbuie Pipes and Drums’ is a Dutch pipe band which was established in 1990, is closely connected to the clan MacLaine of Lochbuie and is their officially recognised pipe band. The band adopted the MacLaine of Lochbuie tartan (both clan tartan and hunting tartan) in their uniform. The band presents itself as a ‘military style’ pipe band, wearing a military uniform based on that of the Argyll and Sutherland Highlanders (now known as Balaclava Company, 5th Bn. 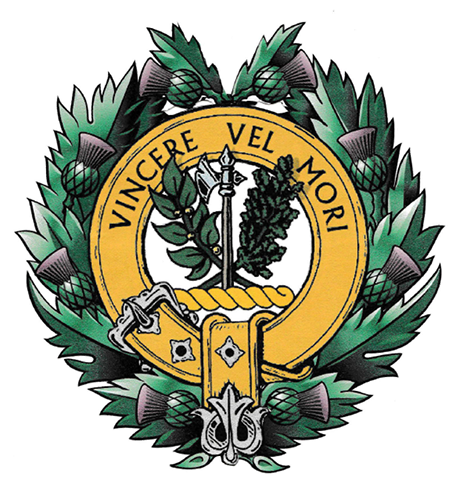 The Royal Regiment of Scotland). The band performs regularly, both in the Netherlands and abroad. In 2015 the band made a three-day tour on the Isle of Mull, Scotland, to celebrate their 25th anniversary.